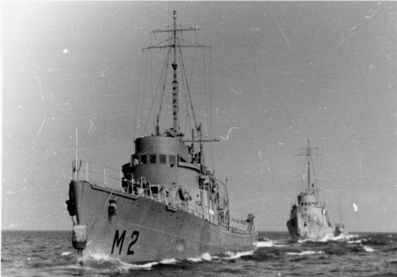 Two minesweepers of the SØLØVEN Class in a line-up, in front is the SØBJØRNEN with SØULVEN just behind. 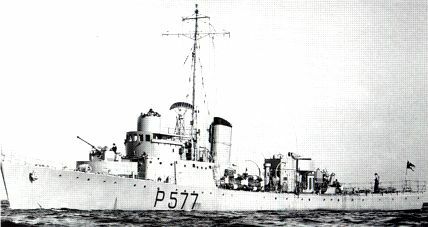 The last four ships of this class were rearmed and classified as patrol vessels after August 15, 1957. 7 tons of fixed ballast were installed aft to ensure stability. 1 ea ATLAS geared turbine 2,200 Hps. SØHUNDEN after rearmament in 1957 and classified as patrol boat. 40 mm machine guns are now M/48 and gun sight is mounted on top of the wheelhouse.